HÀ NỘI — The Ministry of Industry and Trade has urged supervision to be enhanced on certificates of origin for Vietnamese electric bikes. The warning over origin fraud was raised after Việt Nam’s electric bike exports to the European Union (EU) increased sharply after the European Commission (EC) imposed anti-dumping tariffs on products from China. 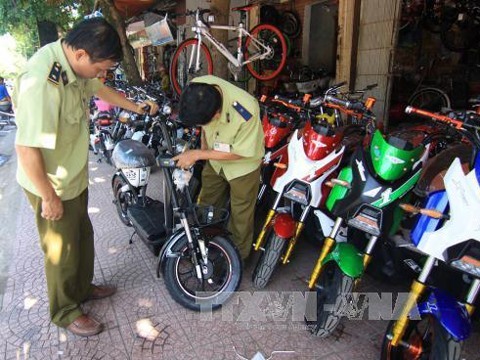 According to the ministry’s Trade Remedies Authority of Việt Nam, the EC issued a decision on the imposition of anti-dumping and countervailing duties at rates ranging from 18.8 per cent to 79.3 per cent on electric bikes from China. The duties were imposed for five years from January 18. The ministry cited an EC report that during the investigation period from October 1, 2016 to September 20, EU imported 940,001 electric bikes, of which, 74 per cent came from China, resulting in a share of 35 per cent in EU markets. Findings also showed that since the EC initiated investigation on electric bikes from China, Việt Nam’s exports of electric bikes to the EU reached nearly 138,470 units, worth 66.9 million euros (US$75.7 million) in January-November 2018, representing a rise of 47.4 per cent in volume and 22.6 per cent in value over the same period of 2017. Việt Nam held a market share of 12.4 per cent of the EU’s electric bike import market. The ministry said that the sudden and rapid increase in Việt Nam’s electric bike exports to the EU coinciding with the EC’s imposition of anti-dumping duties on products from China could lead to investigations by the EU on imports from Việt Nam. The ministry was working with the Việt Nam Chamber of Commerce and Industry on enhancing the supervision on the certificates of origin for Việt Nam’s electric bikes with special attention on origin fraud. It also enhanced cooperation with the General Department of Customs to keep a close watch on Việt Nam’s export of electric bikes in an effort to prevent origin fraud, which may negatively impact Việt Nam’s exports.